Legal injustices were another reason for the dead to return. Perhaps the most dramatic motif for a haunting was that of revenge, the ghost often taking the form of the victim of a murder seeking retribution from their killer. Other hauntings were said to be caused by those whose life had been so wicked that they were condemned to wander the earth as lost, imprisoned spirits. Other common candidates for a return from the grave were those who had died tragically, especially suicides. Some ghosts could not rest because their remains had not been buried with the correct rites, a particularly common motif in Classical tales, others due to the disturbance of their graves by some unfeeling mortal. A number of ghosts, though, were far less sensational, returning merely to continue the routine they had enjoyed on earth, perhaps visiting a favourite place or pursuing their former employment as if they had never left it. It is impossible to separate the reasons for and functions of ghostly visitors from the purpose and motives of those who have recorded apparitions and hauntings over the years. Any examination of stories of hauntings from the ancient world up until the present will reveal how the reports are manipulated to reflect contemporary events and concerns. Indeed it would be true to say that every era experiences its ghosts according to a defined set of traditions and expectations, most frequently based on religious doctrine regarding the afterlife and social conventions. 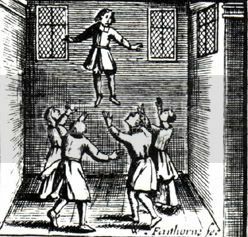 There were a number of important studies of hauntings made in the 17th century which still exert an influence on the way we see, research and record ghosts today. Probably the most significant of these was Joseph Glanvill’s Saducismus Triumphatus (1681). In this book Glanvill, a clergyman and philosopher who believed in the malign power of witches and magic, advocated the investigation and examination of supernatural occurrences in order to prove their existence. Glanvill vehemently attacked those skeptical of demonic powers and maintained that the denial of such spirits and demons was tantamount to atheism. Other writers of the same period, including English Puritan church leader and theologian Richard Baxter (1615 -1691) and Richard Bovet, author of Pandaemonium, or the Devil’s Cloyster (1684), recorded accounts of hauntings and witchcraft with the express purpose of demonstrating and maintaining a religious system where ghosts and angels revealed the hand of God in human affairs, whilst witches and demons were proof of the very real existence and influence of the Devil, the arch enemy of the Christian faith. Similarly the rise of Spiritualism in the mid to late nineteenth century reflected the desire of many people for proof of an afterlife. In the more materialistic Victorian society people naturally required tangible proof of spirits, rather than mere tales, hence the appearance of the darkened séance rooms and such things as ‘spirit photographs’, ‘ectoplasm’ and scientific experiments into alleged spirit manifestations. Nowadays there are a myriad of different reasons why a ghost is thought to appear and why such stories are recorded. The media, especially the internet, has a huge role in collecting, exaggerating and disseminating ghostly tales of varying degrees of reliability. Local books on ghosts and the supernatural are hugely popular, though similar works about regional folklore are much less well known, which is surprising since many of them contain the same tales, though told in a less sensational manner. Powered by WordPress v 4.9.10. Page in 0.249 seconds.